Welcome to the CPA website! The Center for Photographic Art is an event-driven member’s non-profit organization. We are devoted to preserving and passing along the photographic knowledge and traditions that were first embodied in our gallery by Ansel Adams, Bret Weston, Wynn Bullock and The Friends of Photography. With a physical gallery, we are able to provide a wide variety of exhibitions, ranging from famous photographers, thru contest winners, and on to exciting new talent. On the other side of the exhibition coin are our events. We hold courses, member’s nights, fund-raisers, lectures and more. Finally, there are the benefits for members only. We suggest you simply roll your cursor over each of the main menu items and see what is there. All that said, your main interaction with our site is through our Events Calendar. 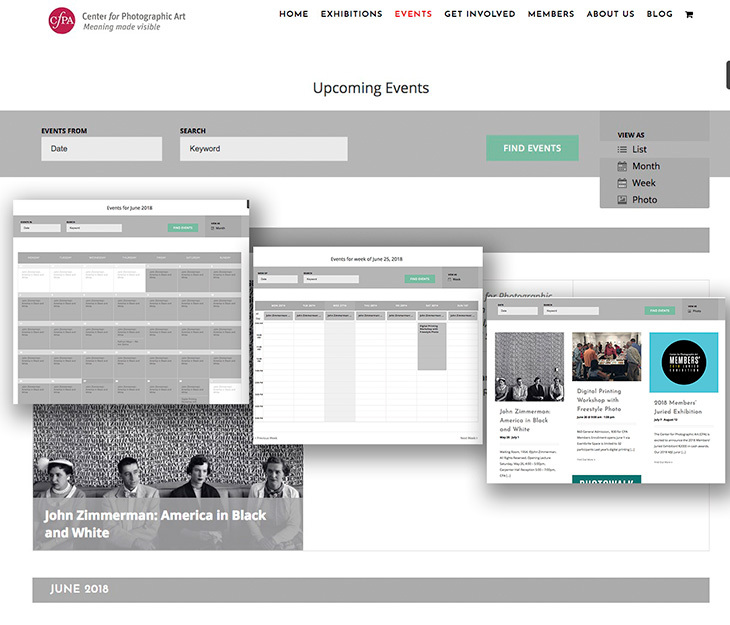 It automatically formats events in different ways on various pages. For example, on the home page you’ll see up to six “Current and Upcoming Events.” Click on any of them, and you’ll go directly to the main page for that event. Those main pages will have all the details you’ll need, and/or links to entry forms, instructions and so on. Under the “Events” menu we have categorized the various types of events, to help you find what you’re looking for. There is also access to the “Full CPA Calendar.” Using the menu in the upper right of that page, you can adjust your view into a list (the default view), by month or by week. There is also a “photo” view, which is what you see on the home page. Finally, at the top of the page, you can search for events. As a member, it’s only natural that you’re interested in the “Members” menu. If the first menu item says “You are NOT logged in” just click, and you’ll go to the login screen. Next is the gateway to joining the CPA as a supporting member. There are options to fit every budget. One favorite membership option is “Member Photographer” and if you’ll click on that menu item, you’ll see why: each member photographer has his or her own page on our site; a link to their own site, a biography and statement, and a selection of sample images. This is one of our most popular options. Up next is the entrance to member’s benefits. Members have access to interviews of well-known photographers and videos of lectures and gallery artists. Member can also more than cover the cost of membership by using their discounts, such as for PIE labs; fine art photographic prints; and discounts for entries to our juried competitions. The “Resources” page currently offers an automated selection of articles of interest from around the web. We will be expanding the resources to cover additional useful links and features. As members, your suggestions for what would make this page even more useful would we welcomed. After all, it’s _your_ CPA!